The luxury of retirement has given me an opportunity to do some things I never got to do before. One of those things was a trip to the New Hartford Farmers’ Market. It was a treat meeting people, talking with neighbors, and listening to the band, and picking out produce, pickles, hot sauce, butters and oils. Beautiful baked goods are in abundance! There is so much available! 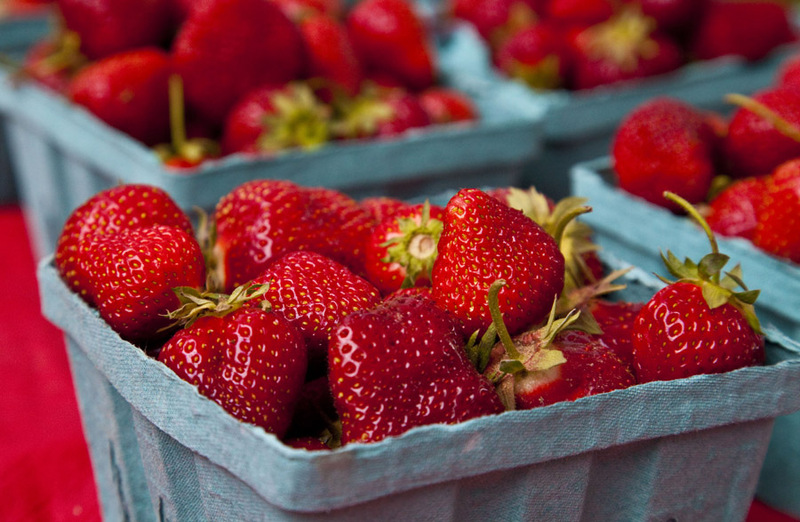 These strawberries – since I was 13 years old and picking strawberries for 5 cents a quart at Hogan’s in Burlington, I have not been able to experience the smell of fresh, just picked berries. I was in Heaven. These were at Barden Farm’s Booth. sweetener (sugar, honey or stevia) to taste. These berries were so sweet that I went without. Put in fridge for an hour or so while the jelly “gels” and viola! Instant, fresh berry, vitamin & protein loaded jam to use on toast, over pancakes, over ice cream or in your yogurt. Thanks to the chia seeds, you’ve got 2 grams of protein & 5 grams of fiber while the strawberries add another 1.5 grams of fiber to this yummy concoction! If you sat down and devoured the whole serving, you’d have a nutrient dense 90 calorie (not including your sweetener) dessert. Enjoy those fresh berries while you can!!!!! 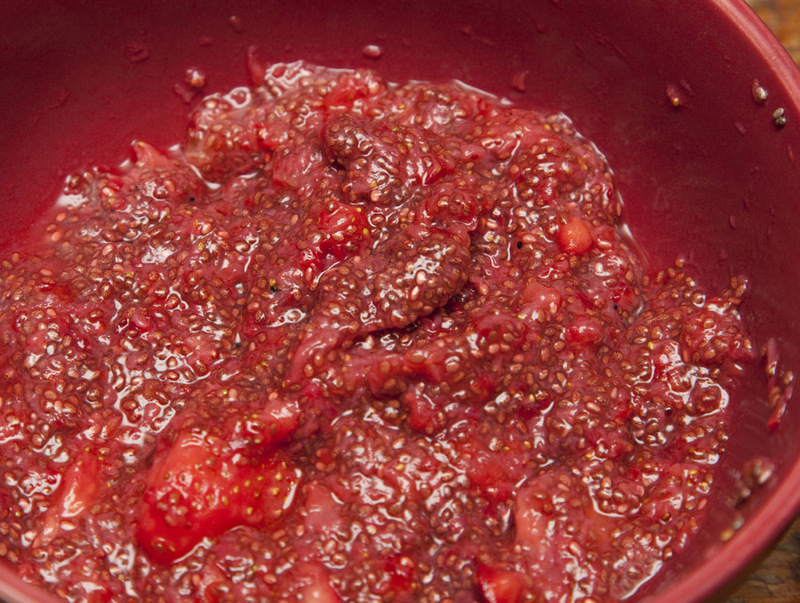 (From Sharon – I have to say, I screwed up and put the 2 TBS in 2/3 cups of berries, which may be a little heavier on the protein so the picture reflects an abundance of Chia seeds.) Since Chia seeds are similar in texture to strawberry seeds, you really don’t notice the Chia. Also bought these beautiful radishes at Barden’s booth – and I LOVE radishes with sea salt. 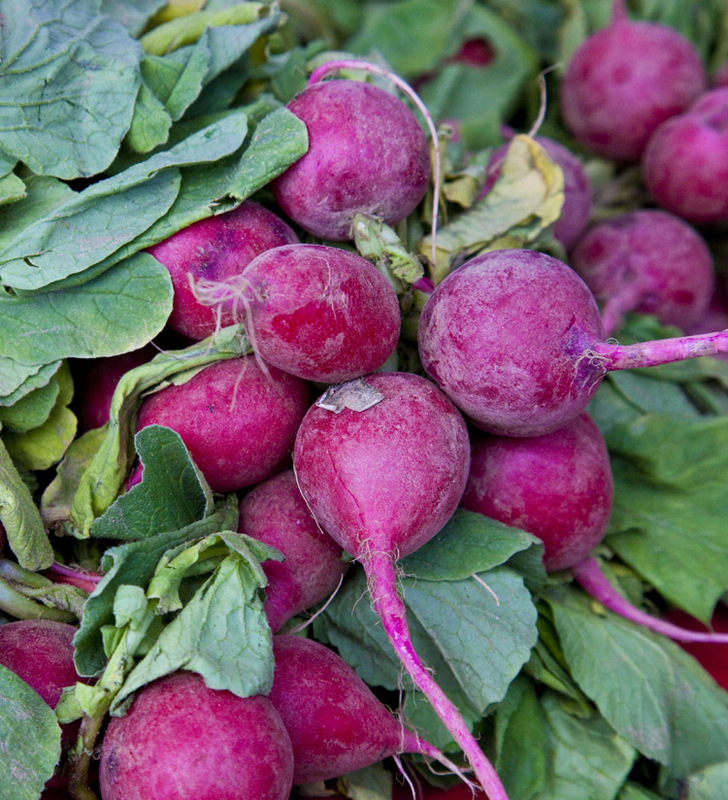 Fresh Radishes – add sea salt. YUMMM! 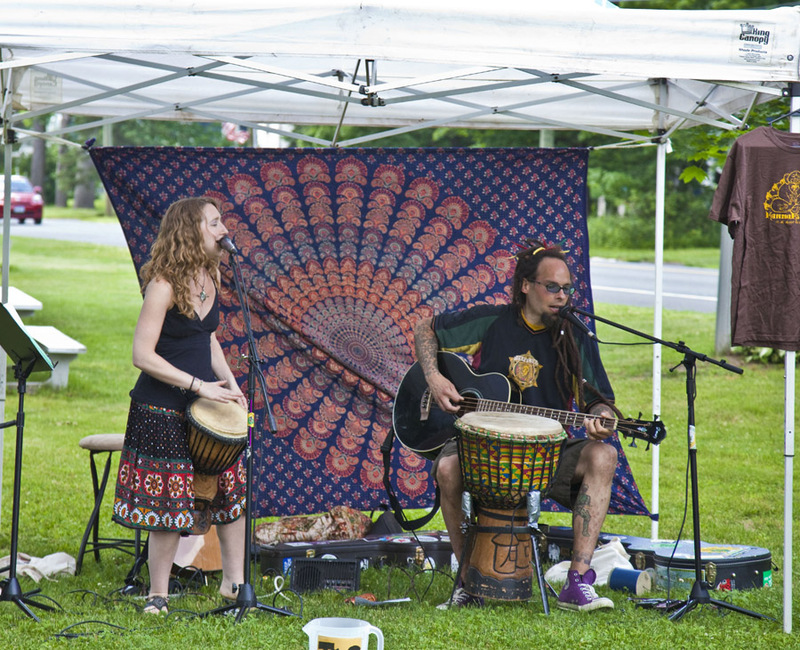 While we were hanging out, the band “HannaH’s Field” were providing entertainment. They were fun, playing for the moment, singing of fresh food and nutrients, and they did a little rap tune that made my Grandson, Clay do a little swagger. Couldn’t say Clay danced, because he might not approve. It was fun to visit Hillhome Country Products. 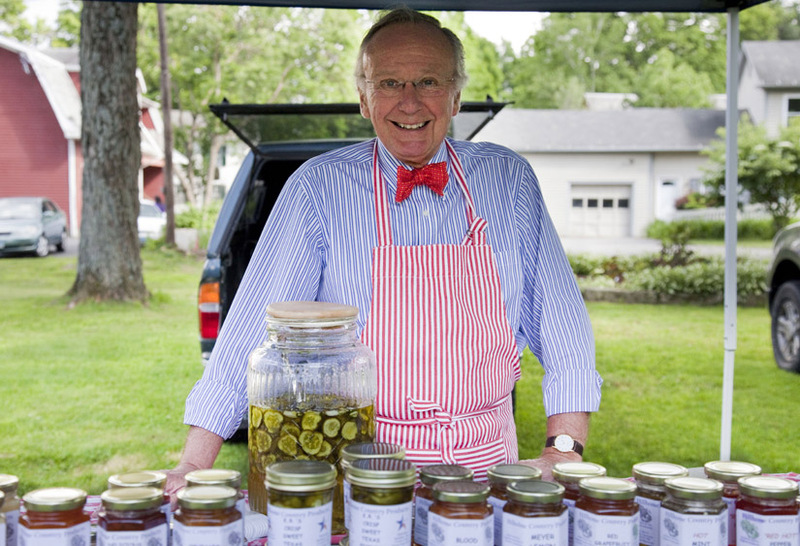 Dave sports a bow tie and a pinstriped apron. A good salesman always has a great smile! I have to say I tasted their Tangy Lemon Butter and K.R’s Crisp Sweet Texas Pickles and bought both, plus a hot sauce for Dwinal who stayed behind. We stopped at another booth for lettuce (me) and Kale (Krista). I’m new to the Kale experience, so I’m going a little slower. My lettuce is about as big as my pinky, so I was happy to get some fresh. I’m not sure which farm it was, but will be back to get to know everyone through the summer. We have an abundance of really good fresh food locally. Stop by any Friday in the summer from 3:00 pm to 7:00 pm (if you’re new to town it’s in Pine Meadow on the Green), and maybe we’ll see you as we move around the booths. If we don’t, you’ll get fresh produce, in season, and nothing tastes better. « It’s Time for T-Ball with New Hartford Youth Baseball!